He was booked for a misdemeanor and released from jail in Largo at 9:53 a.m. on $250 bond. A member of the police department's DUI squad pulled Swindal over at 2:12 a.m. after he cut the officer's cruiser off in traffic, police spokesman Bill Proffitt said. "She had to brake and take evasive action to avoid hitting him," Proffitt said. 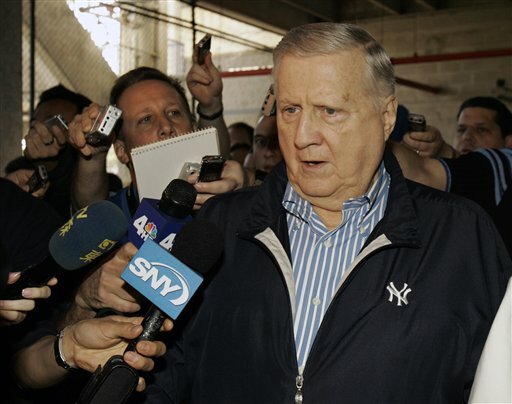 Baseball commissioner Bud Selig called the arrest "a matter for Mr. Swindal, the Steinbrenner family and the local authorities in Florida." "Given the circumstances, I will continue to monitor the situation and will review the ultimate disposition," Selig said in a statement. "Until that time I will have no further comment." Swindal did not immediately return a message left on his cell phone. Swindal also is part of a group bidding to become the next operator of New York's three major thoroughbred racetracks _ Aqueduct, Belmont Park and Saratoga. AP Baseball Writer Ronald Blum in Tampa contributed to this report.